2016 was another great year for Atlanta’s housing market which saw its 4th consecutive year of price appreciation. Not only that, but property values have gone up almost 62% since the bottom (March 2012) of the Great Recession according to the Case-Shiller Index. No, that’s not a typo – which means that on average, a home worth $100,000 in March of 2012 is now worth roughly $162,000. With that much appreciation in play, and demand rising, it’s not surprising to see new development projects popping up all over the city again as developers try to keep pace with demand and neighborhoods continue to reinvent themselves. So what’s in store for Atlanta in 2017? Okay, let’s dive right into what everyone wants to know – how much are homes going to appreciate in 2017 and what will be the hottest neighborhoods? Whenever you’re making predictions about the future you’re always going out on a limb, but I’ve outlined a few of the prominent points that led me to these conclusions below so be sure to take a look. 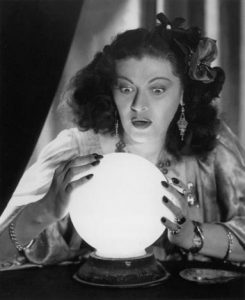 And like all forecasts, make sure you take this with a grain of salt. As noted earlier, real estate prices in Atlanta have been going up on a year-to-year basis since 2012 and I expect to see this trend continue – only at a more modest pace. While 2012 and 2013 saw incredible double-digit price increases, the acceleration has been slowly reverting to a more stable pace. On average, we should expect prices to appreciate 3-5% throughout the Greater Atlanta Area during 2017 (we saw a 5.9% increase during 2016 – per the Case-Shiller Index). One of the biggest reasons property values have risen so quickly over the last several years has to do with the supply of homes. When the Great Recession hit in 2009, developers stopped building new homes almost entirely. And while they’ve been slowly ramping up since then, they’re still only at 60% of their normal pace. Additionally, Atlanta’s population has also grown more than 10% since 2010 – according to SustainAtlanta. 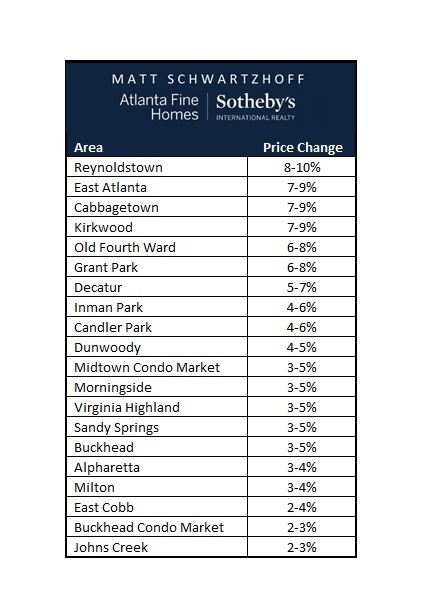 This has led to low inventory levels throughout Atlanta, particularly in high-growth counties such as Fulton, Gwinnett, and Forsyth, which grew 11%, 13%, and 20% respectively during this time. Another challenge that builders and developers have faced in recent years is a very tight labor market. If President-elect Trump follows through with his tougher immigration policies, the market for skilled workers will tighten even more so, causing an increase in construction costs and possibly slowing any advances on the supply side. Mortgage rates have jumped nearly ¾% in the last 3 months and are currently topping 4% for the first time since early 2014. While that’s still historically very low, it’s enough to have a real impact on monthly payments so expect buyers to begin looking for more concessions from sellers to compensate for the increase in rates. That said, we’ve also seen some loosening of credit and mortgage restrictions during the past two years, as well as an increase in availability of both jumbo and low down payment loans. With rates going up, banks may also be more willing to work with buyers as they try to make up for the decline in their refinance business. While increasing rates could dampen price appreciation in 2017, it could be offset somewhat by the increased availability of mortgages. Having watched the damage inflicted by the financial crisis of 2009, Millennial’s have become notorious for shunning homeownership. This has helped drive demand for rental properties, and subsequently, the increase in rental rates in recent years. However, rental rates have finally reached (and even exceeded) the breakeven point with mortgages for a comparable homes. This has encouraged many Millennials to reconsider home ownership and we should see another uptick in demand from this segment in 2017. Once again, I expect the hottest markets to be found intown, especially in neighborhoods where the beltline is slated to be developed within the next 12 to 24 months. This will be particularly true for neighborhoods that have also developed their own distinctive identities and sense of community, such as Reynoldstown, Grant Park, and East Atlanta. While these areas have seen strong double-digit appreciation over the last two years, I think there’s still gas in the tank and they have the potential to outperform the rest of the market. Interestingly, the trend towards neighborhoods creating their own distinctive feel has begun to spread into the suburbs as well. The success of large mixed-use developments such as Avalon in Alpharetta has encouraged other suburban Atlanta neighborhoods to begin developing plans for their own multiuse centers. Neighborhoods such as Sandy Springs, Peachtree Corners, and Buckhead have all submitted proposals for large-scale projects that include parks and variety of mixed-use developments. Plans are also underway for another “Avalon/Atlantic Station” styled community in northern Alpharetta (off McFarland and 400) which will be called Halcyon. With this in mind, I believe we can expect to see continued pressure on the supply side for the foreseeable future. And while an increase in mortgage rates will help bring price appreciation back to a more moderate pace, the impact will be offset somewhat by the increased demand from Millennials, as well as the possibility of increased construction costs for new developments. 2017 should once again be a great year for sellers, but with several years of steady growth ahead, it will also be a great time for buyers to enter the market as well.